Photos of fetuses - these three miscarried bunnies appear to be roughly 1.5 - 2.5 weeks in gestation. Rabbit Fetus Images: When a rabbit pregnancy does not go as planned, you may end up with no bunnies, dead fetuses, or malformed fetuses or bunnies. On a few occasions we have discovered dead fetuses in or under the cage of a pregnant rabbit. We wanted to show you these pictures to help you identify what you might find with your own does. 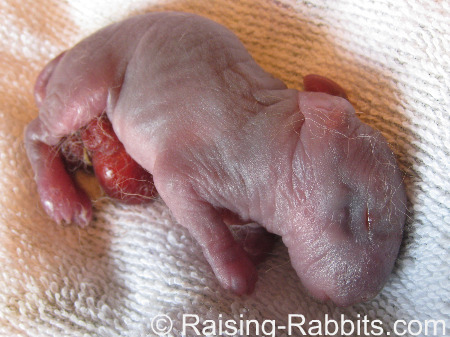 The doe that dropped the above rabbit fetuses aborted her entire litter. But, the discovery of dead fetuses does not always mean your pregnant rabbit is done with her pregnancy. More recently, a doe delivered a healthy litter, but along with the live kits she delivered a partially developed dead fetus, and a tiny fetus that looked exactly like the fetus images above. This photo is of a full-term bunny that lived just minutes beyond birth. The little guy's guts were born on the outside of the body, and it was missing one eye. Vitamin A toxicity and deficiency can cause defects in bunnies, especially neural tube defects such as hydrocephaly. Additionally, the more that genetically modified (GMO) feeds find their way into animal feeds, it is expected that we will see more disruption of fetal development due to the foreign (toxic) molecules produced by these GMO forages. If you are able to make an accurate determination of cause and then correct it, great. Otherwise, when the doe undergoes a miscarriage or has kits with birth defects, there is not much else one can do except to rebreed the doe and try again. We really like the Sherwood brand of rabbit food, as it is soy- and corn-free.